Excessive sweating can complicate your life and lead to physical discomfort and emotional anxiety. Fortunately, experienced dermatologist Dr. Gabriele Weichert can help reduce your sweating and improve your confidence in social and professional interactions. If you live in Central Vancouver Island and suffer from hyperhidrosis, Synergy Medical Aesthetics’ state-of-the-art office in Nanaimo can help. Call us today at 250-591-1566 to schedule a consultation with Dr. Weichert. Hyperhidrosis is a condition that refers to excessive sweating in the armpits, hands or feet. Those who experience the condition have the same perspiration triggers as everyone else, such as exercise, stress and heat, but they tend to also sweat unpredictably and severely throughout the day regardless of weather, emotions or activity level. Should I Consider Hyperhidrosis Treatment? Does perspiration seem to occupy your thoughts and plans? Do you avoid shaking hands for fear of embarrassment? Do you constantly keep your arms down so no one will notice your sweat stains? 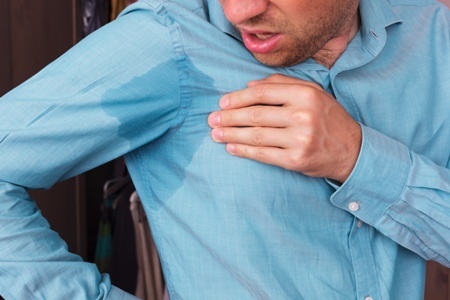 Are you self-conscious in intimate situations because you’re afraid of sweating too much? Do you avoid certain clothing because you fear unsightly perspiration stains? If you answered yes to any of the questions above, you should consider scheduling a confidential consultation and assessment with Dr. Weichert. She will evaluate your condition, answer your questions and explain all of your treatment options. We understand what a personal issue excessive sweating can be. At Synergy Medical Aesthetics, we will always treat you with dignity and professionalism. You will always be assessed and treated as an individual, and never as just another number. Dr. Weichert is committed to developing a customized non-surgical treatment plan that suits your individual needs and lifestyle. You don’t have to live with the embarrassment and discomfort of excessive sweating. To find out which hyperhidrosis treatment option is right for you, you need to call Synergy Medical Aesthetics today to schedule an in-person, confidential consultation and assessment with experienced and knowledgeable dermatologist Dr. Gabriele Weichert. You can schedule your visit by completing the form on this page or calling 250-591-1566. Our office in Nanaimo welcomes patients from throughout Central Vancouver Island.